Someone very special in our lives had a baby this week and so I wanted to knit a gift for the baby. Sometimes my favorite projects are ones that I can do mindlessly while watching TV – like the crocheted t-shirt yarn rugs. But when I’m making something for a baby or someone who is sick, I like to be very mindful and prayerful. 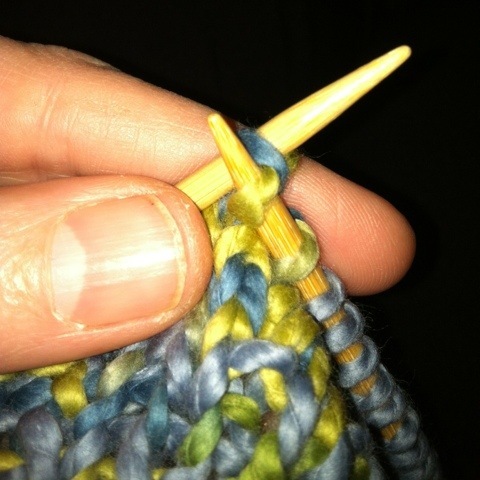 I believe in the power of prayer and so, as I knit I like to think about the recipient and pray for them. In my imagination I can see the prayers and good thoughts being woven into each stitch that I make. My hope is that when they receive the gift they will be surrounded with love and prayers. I believe that the love and prayers I send their way are the biggest part of the gift I make. Welcome to the world Peter – you have wonderful parents, grandparents, aunts, uncles and friends – you are truly loved. Prayers for health and prosperity knit into these stitches. 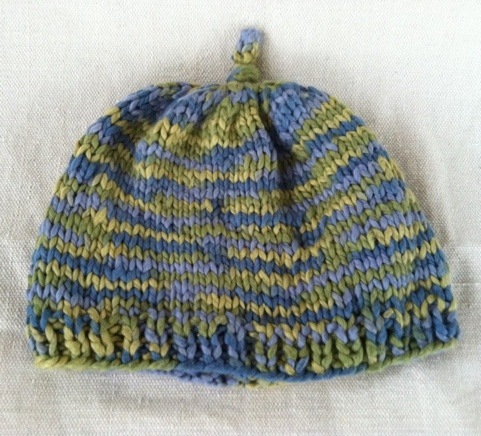 The finished hat, it may or may not fit but prayers are always the right size. Beautiful words and a thoughtful gift… Happy Birthday Peter !! Jess, I love your Mindful way of making a gift for someone—-thank you for sharing your crafts and thoughts. « Best Seat in the House!